Of the 310,000 children who actively participated in project activities, 26 percent took part in coaching or mentoring sessions (7 percent more than last year). Of this group, 75 percent are children participating in the Conn@ct.Now! project in Uganda. 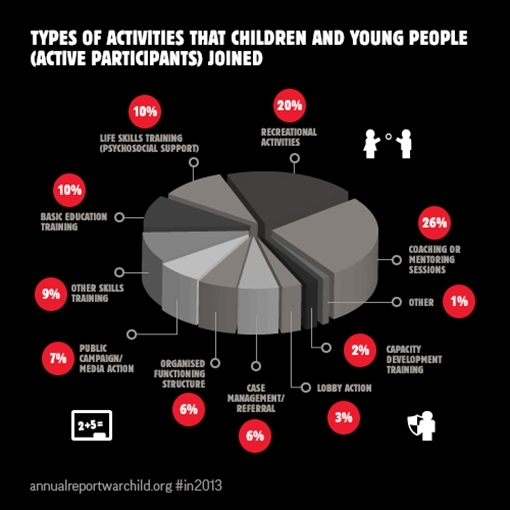 We saw the biggest increase in the number of children that participated in recreational activities. Of these children, 41 percent are Syrian refugee children in Lebanon. Because of the continuously changing situation and tenuous security in Lebanon, our emergency project activities for Syrian refugee children provide psychosocial support in a less structured way than our regular life skills courses, and therefore fall in the recreation activities category. Our regular life skills courses (I DEAL and BIG DEAL) and basic education training each accounted for 10 percent of all active participants. We saw the biggest decrease in the number of children that participated in public campaigns and media actions, in part due to the closure of our programme in Sierra Leone, in which campaigns where an important part of activities. We also reached substantially less children through public campaigns in DR Congo, as we moved our projects to remote and less populated areas.